They say that ‘beauty is in the eye of the beholder’. For me, it doesn’t matter if people find me attractive or not. That’s not the point of the competition and it is not what I’m trying to achieve. Miss Universe’s tagline is ‘confidently beautiful’, its aim is to make women feel confident in their own beauty, to be genuine, to have respect for oneself and others as well as to make an impact based on your values and actions. I don’t think that being a ‘conventional beauty’ is an achievement in itself. There is no substance in it because beauty will always fade and the meaning of being ‘beautiful’ is different for so many people and cultures all over the world. And that is why I wanted to go beyond beauty. I didn’t enter the pageant to chase validation or approval from others, or to flaunt my beauty; I entered Miss Universe due to other intentions. As always, true beauty begins with self-love and compassion for oneself and when you have the two, whatever you do, you will do so with integrity and grace. If your intentions are pure, I believe that God will make it easier for you to achieve the things that you want to accomplish. My intention to compete for Miss Universe is because I believe that the journey will help me with my growth as a person and I want to empower young girls along the way. I chose to compete in Miss Universe rather than any other pageants due to the values that it has. Miss Universe is not a typical ‘beauty’ pageant. The pageant itself is more focused on one’s character and their efforts to prove that they are the best woman for the title. There were no measurements of my height or my weight and so it isn’t superficial or demeaning. I can personally vouch that Miss Universe New Zeaalnd is more than physical beauty and I wouldn’t have competed in the pageant if it was against my own morals or values. Personally, I find it beautiful when a girl is their most authentic self and has good character and is sincere. It’s also beautiful to see a woman who knows their worth, especially in a time where we are constantly exposed to the media and social media. Physically, beauty to me is when women can embrace their uniqueness and their diversity. By being in the competition as the first Muslim Hijabi, to make it into the finals for New Zealand and one of the first in the world, I want to break boundaries and stereotypes. Most of all, I want to change the culture as I want all girls to feel included within the standards of beauty. I have also made history by being the first Malay to ever compete in a pageant as big as Miss Universe. Before the finalists were released I remember thinking that I did not want to wake up one day and have my face all over the internet. But that was exactly what had happened on Instagram. Then later on in the afternoon, one of my best friends told me that I was trending on Twitter in Malaysia. And I was like WHAT, I’m trending on Twitter? But it was true, there were almost 9000 retweets and over 6000 likes. A couple of hours later, the media released articles about me. And I went VIRAL. Everything just blew up like crazy. And let me tell you, it has been crazy ever since. It’s been over a month since I went viral and I am constantly still getting asked to do interviews. To be honest, I initially declined to do interviews as I needed my story to be told with my own truth and that it had to be presented in the best way possible. So, I had a princess, Raja Sarina Iskandar from Malaysia to write about me in her column, since I trusted her as we are friends and she writes so beautifully to write to the heart. I remember her being so excited and saying that she felt so honoured to be the first reporter to interview me. And I’m just like wait, you’re a princess, I am that should be honoured to even know you. You can read the article, 'creating waves and redefining beauty' here. You see, I never had the intention to have so much attention on me. I only went viral a month after the finalist has been announced. I could have easily contacted any media, but I didn’t want to unless I knew that I was prepared for what was to come and coincidentally I was ready by then. And it was perfect timing because we were just about to leave for the Miss Universe Retreat to Thailand (which, by the way was the most AMAZING time of my life and will be my next blog post), so luckily I had that as an excuse to not do the interviews. Not only did I go viral in Malaysia, but I also went viral in Indonesia too where I had media attention in the middle-east. But before all this had happened, I contacted Radio New Zealand. I thought they would be the last media to contact back because from what I understood, it’s a media platform that only publishes important issues as I always listen to podcasts during my lectures. I remember sitting in lectures listening to these podcasts and thinking, one day I will have something so groundbreaking that Radio New Zealand would interview me too. And so it has always been a dream of mine to be interviewed by them. By a long-shot, I sent an email Thursday morning. They called me Thursday afternoon and Lynda from the Voices program flew all the way up from Wellington to Hamilton the very next day just to interview me. The executive producer from Radio New Zealand really wanted my story as a scoop and it felt so surreal. It only hit me then to how big of a deal my story was when that had happened. And what do you know, when the interview was published, the title they had was: 'Groundbreaking: First NZ beauty contestant to wear the hijab'. Then when I was in Thailand for the Miss Universe New Zealand retreat I woke up and a reporter from Newshub TV3 was messaging me, I was literally still in bed and they had asked to interview me in ten minutes. I don’t know how I did it, but I managed to compose myself within that short amount of time. And although I was on the Newshub 6pm news, the video you saw of me on the beach was literally taken at 5pm and was sent at 6pm. Being ‘famous’ is actually not as glamorous as you think it is. I’m not saying all this to gloat about my achievements but because I know that some of us are heavily influenced by media and the social media. When I was on FreeFm the other day they had a hashtag that said: Less Kardashian and more culture. I actually do admire the Kardashians but I thought that this hashtag was so relevant and it’s exactly why I am doing this. I see so many girls wanting to look like or act like a Kardashian or compare themselves to all these girls that they see online. But the thing is, they are already beautiful and amazing themselves. I just hope that with my journey, I help girls see it and be confident in their own beauty. Secondly, what I would like to say is be careful with what you put up on social media. All the photos used on those articles were taken from my Instagram. Therefore, anyone can use whatever you put up on the internet. I also want to say that your story is so important because it shapes how you perceive things. And in a world where there are so many misunderstandings and different perspectives, you have to stand in your own truth. Nonetheless with all the media attention on me, comes the negative comments. I see them and I read all of them. But the thing is I don’t believe in them. I know my own self-worth and I know why I am doing Miss Universe. Whatever anybody else says, it doesn’t matter, what matters is what YOU think. I am so glad that I have worked on myself first before competing in the competition because it makes it so much easier to make decisions. Rather than reacting, you respond to things. And you also realise that what other people think of you is actually a reflection of themselves and not you. However, some people have also commented that I am ‘Biasa je’ which means just normal in Malay. This is so true. I am a normal human being and as human beings, we make mistakes and we have our own perspectives, we have our own hopes and dreams and intentions. So I want to own being biase je. Although it’s not about physical beauty, by being tan, short, not conventionally skinny and wearing the hijab I want normal everyday girls to relate and feel like that they don’t need to conform to westernised ideals of beauty. I’m honestly not doing this for myself anymore, I’m doing this for all women so that they can feel included in society and the ideals of beauty. Together I want us to pioneer a new meaning and culture of beauty where it is more than skin deep. To be honest, the journey to self-love has been long and actually really hard as I always chased validation. It took me years to love myself because I had to accept everything that I am and embrace it too. But now that I have, so amazing things have happened because I do make better choices for myself. By knowing your self-worth, you know what you deserve and the potential that you have. And you won’t settle for anything less than being the best version of yourself. I would like to point out that having an ego and loving yourself are two different things. Loving yourself is being kind and compassionate towards yourself- it’s about being in your higher self to allow yourself to be the best that you can be. Having an ego is thinking highly of yourself and that you are always in competition with others. Being in Miss Universe is not a competition between myself and other contestants, it is a competition within myself to be the best that I can be. So far, the Miss Universe journey has been intense, unpredictable, life-changing and yet the best experience I have ever done in my life. Even today, I still can’t believe that all of this is happening and all of that has happened. There are still two weeks left until the Grand Finals and I know that it will go by so fast. Sometimes it really does feel like a dream. I am so grateful to have been given this opportunity because it has helped me grow into the woman that I want to become. I went into the competition aligned to my own worth and values and during this journey, I’m inspired to be an even better version of myself. 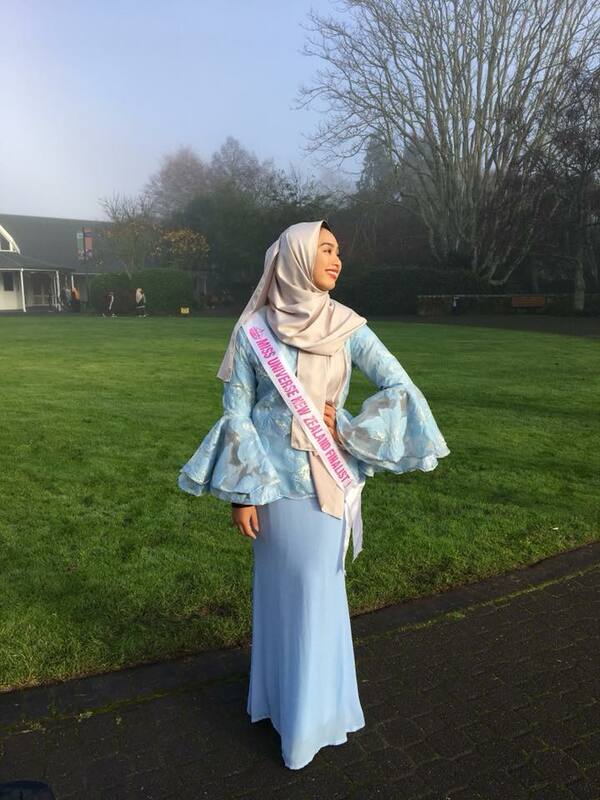 If I had the honour of being crowned Miss Universe New Zealand 2018, I would be making world history by being the first Hijabi, to ever do so and compete on the international stage. My winning could possibly shake the culture of pageantry and the culture of beauty. And now the question that I have for myself and everyone else is: “Is society ready to accept the breaking of those boundaries and stereotypes?” Because if I win, the whole world could be watching and if it does happen, I know that I am strong enough to face it and that God won’t let anything happen in which I cannot bear. I don’t want to win Miss Universe New Zealand, just to win the title. I want to win for all of the girls around the world so that we can start a movement together. If I win the title it could lead to so many possibilities and opportunities, not for myself but for so many women all around the world. Nonetheless, I hope to use the rest of the Miss Universe New Zealand journey to my advantage so that WE can make the best possible difference. So please come and join me on my journey and together, let’s go beyond beauty.